Through my guiding with Costa Rica Expeditions over more than ten years, I met wonderful people without expecting anything more than sharing Nature among ourselves, exploring, learning and loving what we encountered during those nature walks. We shared the passion of discovery among the beautiful vegetation of the different kind of forests found in Costa Rica. We enjoyed the quiet companionship during early morning bird walks, sighting warblers, tanagers, robins, hummingbirds, toucans, quetzals, bellbirds, hawks, among many others. How thrilling it was to see other fauna along the way — insects, leaf cut ants, beetles, leaf katydid, butterflies, mosquitos, etc. We listened to the cacophony of monkeys like howlers, capuchins, and especially the fast moving spider monkeys swinging from branch to branch feeding on fruits, flowers, leaves and insects. Or we would be mesmerized by the slow motion of sloths silently gliding across branches way up in the canopy. If we were lucky, generous Mother Nature would present us with large mammals like tapir, deer, peccary, coyote, agouti, coati, jaguarundi, and ocelot. From time to time, our breath was taken away by reptiles, like caimans and crocodiles, lizards and snakes, and by the marvelous colors of different kinds of frogs and toads. How could we not be spellbound by the wonderful experience of communing with nature? As a child, I loved the television nature programs like Animal Planet, National Geographic Channel, The Blue Planet, among others. I dreamed of visiting magnificent places like Africa, US national parks and South America. I was raised as a catholic child among ten brothers & sisters. For reasons that were not clear to me then, I resisted and purposely “missed” my first communion. I could not believe that our planet took only a week to create, as I was taught according to my family’s religion. At the same time, I was fascinated with Charles Darwin’s theory on the evolution of life. One of my biggest dreams ever since I was 7 years-old was to be able to see where Darwin had worked and what inspired his theory. Never did I think that by guiding in ecotourism I would get the opportunity one day to visit that magnificent place, what I always called Darwin’s Laboratory — the Galapagos Islands. 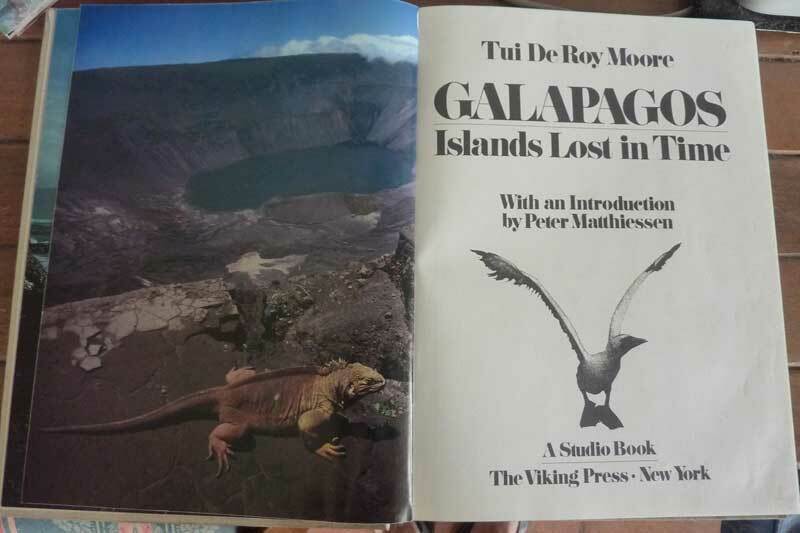 My closest connection to the Islands was a book that Álvaro Ugalde Víquez received from his friend named Tui De Roy Moore, the world renowned wildlife photographer who lived and worked in the Galapagos. 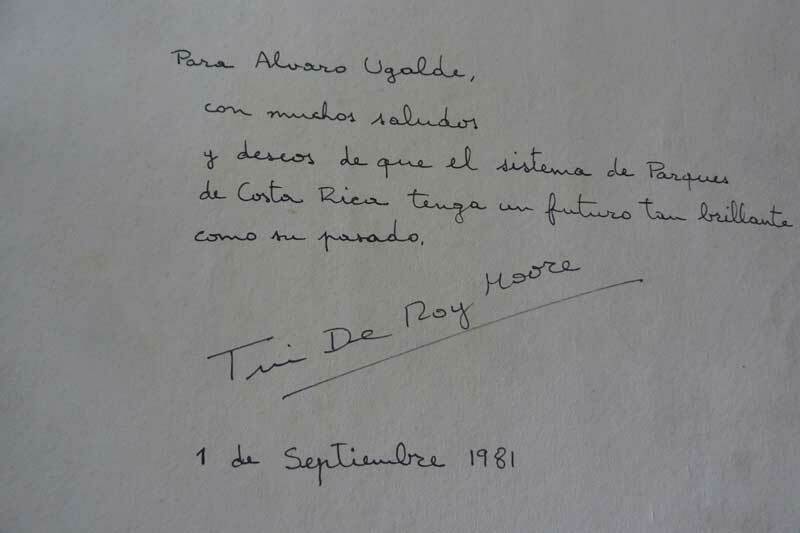 I inherited and still have the book Galapagos: Islands Lost in Time, with her dedication to Alvaro in 1981. After guiding many groups for Costa Rica Expeditions over the years, I was assigned in 1995 to lead a group of 12 people and one young couple of writers from California named Maria & George. We became friends during this 10-day trip in Costa Rica. At the end of this trip I asked Alvaro if I could invite the whole group to his house in San José for a farewell dinner. 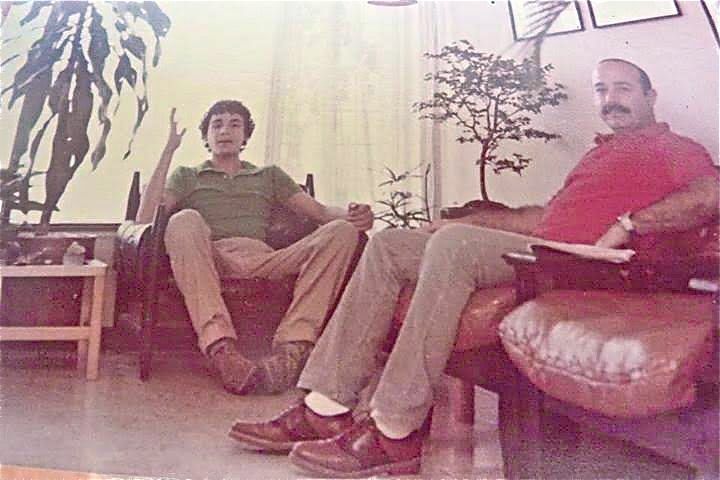 He said, “Of course, this is your house too.” I called my mother and asked “Can you make one of your delicious chicken pie, white rice & green salad?” They all came and were surprised to meet Alvaro, the co-founder of the national parks of Costa Rica. They also enjoyed the nice dinner with us. At the end of the evening, Maria asked me where I would go if I have one place to visit. I simply said “Darwin’s laboratory.” She asked, “Where is that?” So I mentioned “Galapagos.” The next day they left for California. A few months later, I received a message from Maria asking if I could travel in April or May of 1996 with her, her Mother and friends to see the Galapagos. I could not believe that Maria was making my dream come true. I hardly slept waiting for this trip to happen. I flew to Quito to reunite with Maria and met her Mom and friends. To my surprise, they all were writers! Her Mom asked me if I used to watch Batman & Robin when I was a kid? “Yes, and I still do”, I said. Well, I didn’t know this but her father was Lorenzo Semple III, the American screenwriter for the television series Batman. So I was pleasantly shocked in meeting these wonderful people. Our journey began with two days exploring the city of Quito. I was very aware and alert that I shouldn’t drink water from any faucet, only bottled water. But forgetful me, I made the mistake of brushing my teeth at the hotel with water from the tap, and became sick with stomach problems. Coupled to my being in a boat for the first time ever, for the next ten days, I was miserably ill and had to be medicated during the whole trip, but nothing could have dampened my dream of exploring Galapagos. When we met with our naturalist guide I asked him about the flora of Galapagos. He immediately pointed to a huge book about the flora on the different islands that we would be visiting. He said, “You can have it because I will talk more about the wildlife.” So every night while we traveled toward the next island, I studied ahead the plants of each destination. That also helped to distract me from my stomach problem and the seasickness. Every day, the new island was more beautiful than the prior one. No wonder why Charles Darwin came up with his studies of evolution in this magnificent place — the landscape, the animals unafraid of humans, so different from our rain forest where the wildlife skitter away from us unless we appear patient and non-threatening. While we traveled and explored Galapagos, I thought I could die here in peace. I felt ill all the time, but the serenity of this treasure of a place was very comforting. The wonder of Nature in all scale ,from sea lions, penguins, seals , dolphins, sharks, whales, marine iguanas, flightless cormorant, sea turtles, flying fish, great frigate birds, blue footed boobies, red footed boobies, masked boobies, albatrosses, hawks, finches, mocking birds, pink flamingos among many others, then land iguanas, lizards , giant tortoises and snakes, these are a few of the number of species found among all these islands which the amazing volcanic landscape turn into the most beautiful piece of this planet Earth. When we returned to Quito I couldn’t stop crying in front of the group during our farewell. I did not have enough words and tears to thank Maria Semple for making this memorable journey of my life. I had been blessed once again with wonderful people and Nature. My luck turned the day I flew home to Costa Rica via Panama. The plane was delayed. I was stuck in the Quito airport for many hours. I was still feeling terrible and the airport was crowded. I didn’t have access to clean restrooms until I managed to clear security. Finally the plane took off but I had missed my connecting flight from Panama to San Jose. While stranded overnight in the Panama Airport Hotel, courtesy of the airline, I dejectedly called Alvaro. “Calm down” he said, “You are very close to home. You are now trained in tropical island ecology.” He then gave me a shot of wonderful news. “Cheer up” he continued, “You are going in two weeks with me and my father, on a construction supply boat, as volunteers to help build the new park rangers’ station on Cocos Island”, — another one of Mother Nature’s magic place on planet Earth. For many years I heard Alvaro asking different groups of people to do something to help nature and his work on conservation issues. They could be friends, family and foreigners. I have kept this message in mind since 1985 when I was working for his family in a little farm in Atenas. I, too, dreamed of helping his causes. My chance came in 1998 while I was working as a naturalist guide with Costa Rica Expeditions. I took every opportunity to introduce my conservationist-minded tourists to Alvaro and to his work. Little did I expect that one such couple, David and Evelyne Lennette, took up Alvaro’s challenge in a serious way. They were a couple of virologists from California on one of my Nature Conservancy tours, who proposed a garden project using Costa Rican native flora (and fauna) as the linchpin to conservation through education. Knowing my horticultural training at Longwood Garden in Maryland and the Missouri Botanical Garden, they asked if I would help design, build and manage such a garden. Fearful that it was all a dream, it took Alvaro and myself a year to organize our thoughts enough to say yes. I don’t know how you are going to find the corner of this property but just make sure you get me out this forest NOW! That day, they not only got lost, they also encountered footprints of Tapir, puma and others animals in the solid vegetation. After hours of walking and feeling lost and hungry, they returned to San Jose exhausted but thrilled. Alvaro said, “We found it, the dream of Nectandra will begin for the four of us” — Alvaro, Evelyne, David and me.